Sleep is integral for cognitive processes, and indeed life itself1. Sleep appears to be a fundamental property of neuronal assemblies, and recent evidence has shown that rapid eye movement (REM) sleep, is crucial for memory consolidation.2However, there is not yet scientific consensus on the exact biological reasons why sleep is so crucial. Nonetheless, high quality sleep is widely regarded as an essential tool to potentiate your cognitive performance. Studies of healthy sleep have shown that it is broken up into distinct stages: rapid eye movement sleep (REM), and non-REM (NREM) stages 1, 2, 3, and 4. Sleep can be measured by looking at a variety of physiological measures, including electrical brain activity (EEG), muscle tone, and eye movements. Figure 1. 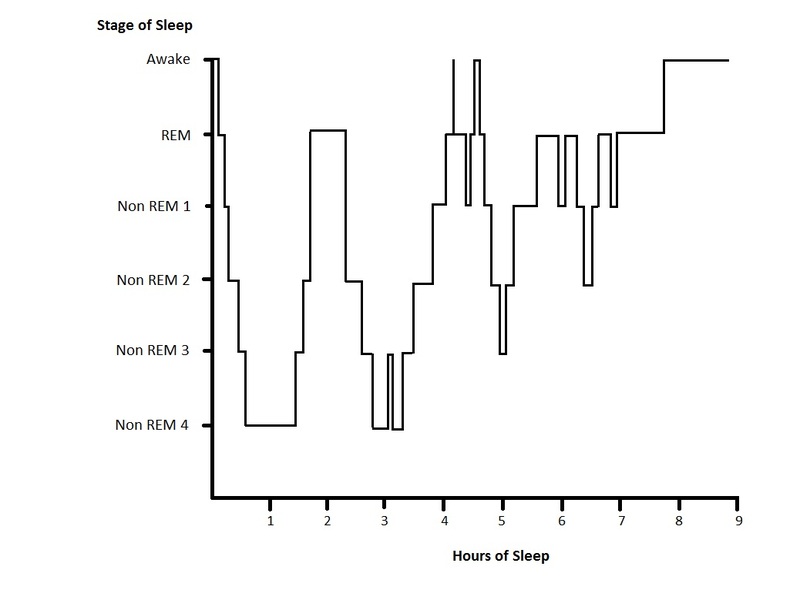 Stages of sleep as measured by polysomnography. Figure 2. Electrical activity during the stages of NREM Sleep. 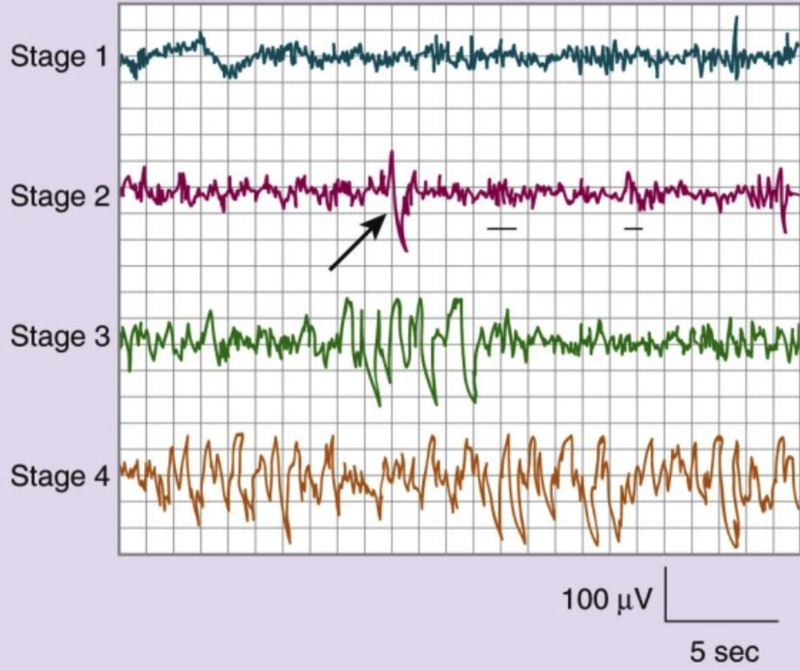 The arrow indicates a k-complex, a characteristic electrical signature of NREM stage 2 sleep. The components of high quality sleep. The first component of high quality sleep is your ability to actually fall asleep (sleep latency). Any minute that you spend trying to fall asleep, is one minute that you're not actually sleeping, so decreasing sleep latency improves sleep quality! The second component is the actual depth and length of the sleeping process (sleep efficiency). Not all sleep is equal. A complete sleep cycle (each of which is comprised of 5 distinct stages) typically takes about 90 minutes. A sleep cycle is comprised of four stages of non-REM sleep followed by REM, or dreaming, sleep. REM sleep is the time when most dreams occur. Recent theories suggest that REM is correlated with memory and learning. Making sure that you allow time for 4-5 full sleep cycles will improve your overall sleep quality. The third component is being refreshed upon waking up. From a functional perspective, waking up refreshed and ready to take on the new day is the ideal after a night's sleep. Reducing grogginess and increasing energy upon waking in the morning is an important part of an optimized sleep nootropic like YAWN. You can increase teh chance that you will be more refreshed on waking by allowing yourself to wake up with natural light or a clock with an artificial sunrise function. In order to best optimize your sleep, avoid any caffeine at least 6 hours before going to sleep (including SPRINT, GO CUBES, coffee, energy drinks, etc.). Turn down the lights at least an hour before going to sleep. Especially avoid harsh artificial light from screens as they generate blue wavelength light, which depresses natural melatonin levels and disrupts a natural circadian rhythm. Consider using software like Flux to modulate your computer screen to warmer tones. White noise generators, natural soundtracks (like falling rain), and relaxing music can all help to induce sleep as well. Eliminating 100% of noise and light while sleeping is important, and you may consider getting blackout curtains or a sleeping mask to block sunrise from disrupting the tail end of your sleep. Diet and exercise can also improve sleep latency and efficiency. Getting exercise, being on a healthy diet, and avoiding food (especially sweets) before bedtime, are ways of encouraging a healthy night's rest. Rechtschaffen, A., Gilliland, M. A., Bergmann, B. M., & Winter, J. B. (1983). Physiological correlates of prolonged sleep deprivation in rats. Science, 221(4606), 182-184. Dijk, D.-J., & Lockley, S. W. (2002). Invited Review: Integration of human sleep-wake regulation and circadian rhythmicity. J Appl Physiol, 92(2), 852-862. Carskadon, M. A., & Dement, W. C. (2005). Normal human sleep: an overview. Principles and practice of sleep medicine, 4, 13-23. Ancoli-Israel, S., & Alessi, C. (2005). Sleep and aging. The American Journal of Geriatric Psychiatry, 13(5), 341-343.